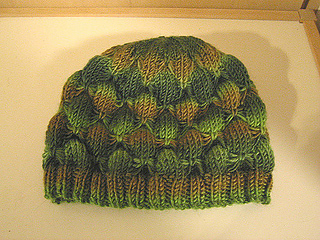 The hat is knit in the round, with the butterfly pattern continuing almost all the way through the decreases at the top of the hat. Use solid color or self-striping for two very different looks from the same pattern. 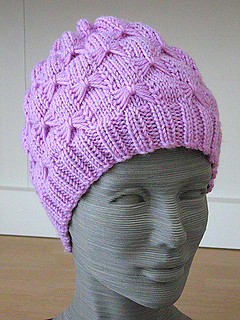 I’ve been asked a number of times if it’s OK to sell the hats made from this pattern. While I realize that it would be difficult, if not impossible, to enforce, I ask that you do not sell them for profit. The exception is making the hats for sale at a school/charity/non-profit fundraiser, in which case I ask that you limit it to 3 hats per fundraising event. Of course, you are always free to give them as gifts or donate to a charity collecting chemo hats, etc.